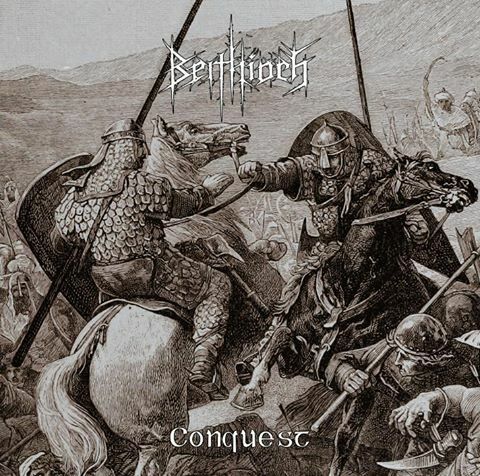 There are things to like about Beithioch‘s Conquest but there are also things that don’t let one fully exculpate it of the bad habits afflicting modern underground metal. At its best, this Irish black/death/doom hybrid evokes the same epic nihilism that was so keenly felt on Into Oblivion‘s unheralded Creation Of A Monolith. Ambitious in scope though far more abridged in length than the Canadian classic, Beithioch make use of subtle counterpoint melodies to pierce through rhythmic bedrock comprising equally of Voivodian dissonance, statelier doom, and the ambient noodlings beloved of modern bands..
Beithioch are most focused when they deliver a fast and tangibly traditional attack, and when they are committed to their harmonic premises, tenuous as they may be. The band imbues these sections with a certain individualistic flair (hear the reverse-rappelling, crescendo-building riff on ‘Smashing The Shrines Of The Fallen‘) that is absorbed without incongruency into the greater musical fabric. More importantly, songs like ‘Conquerors‘ and ‘The Fury Of The Sea‘ appear to be outward-looking and present the listener with a readily cognizable and retraceable context to hold on to through their duration. Far too often, however, Beithioch lose sight of the importance of this same context. When this happens, Conquest becomes impersonal and compromises its bond with the listener, devolving into little more than an exercise in solipsism and meaningless asides. Beithioch are evidently conscious of what needs to be done to avoid this state of torpor, which makes their repeated trespasses all the more unfortunate. This entry was posted in Uncategorized and tagged Beithioch, Conquest, ireland. Bookmark the permalink.